The gorgeous engagement ring Allen chose from Shane Co came in a stylish (but large) lighted ring box, too big for Allen to conceal in his pockets! So we arranged to arrive to the garden early, get the ring from a waiting family member, and then secretly hand it off to Allen once he arrived. This was the first time Allen and Cindy had professional portraits done together, so we kept it casual to work out any jitters from being in front of the camera. We then suggested doing solo portraits of each of them, starting with Cindy, since they were so nicely dressed. This was Allen's opportunity to back out of the frame just a little and drop to one knee while Cindy was distracted. We then asked her to turn and face the opposite direction (to capture the other side of her face of course!) where surprise, Allen was waiting! Following some heartfelt words, tender moments, and Cindy's "yes! ", Cindy's friends and family, who had been waiting secretly nearby, rushed out to congratulate the two of them! 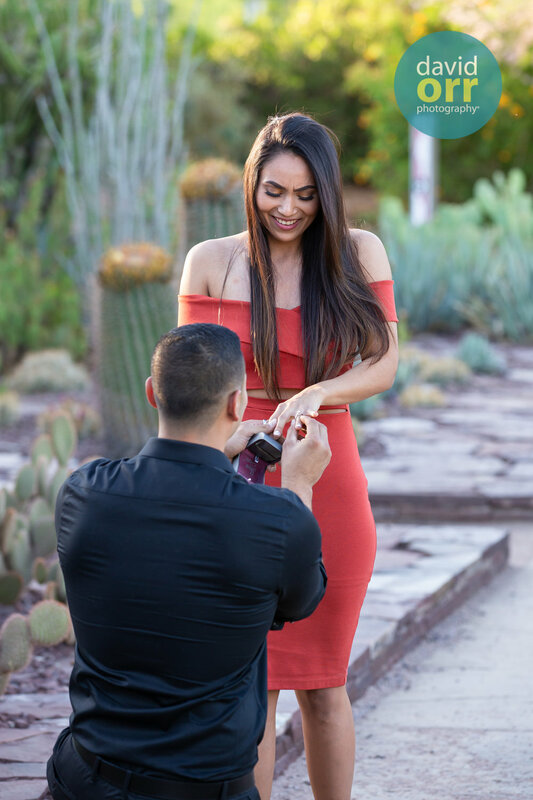 After the congratulations, we took our time exploring the garden to create more images for their impromptu proposal photo session.